Google Analytics classes and training in Minneapolis, MN. There’s still time to save on the best digital marketing training in Minneapolis! We’re a Google Premier Partner whose instructors are all digital marketing professionals working in the field so you get the most up-to-date training possible. Use promo code springmarketing18 to save 10% on all classes and series! Get the most comprehensive Digital Marketing training including Analytics, PPC, Social & SEO. Attend our 4 most popular digital marketing classes, receive your Digital Marketing Certificate, and save $550! Google AdWords – Learn how to create, manage and analyze high-performing online advertising campaigns. Learn what new features are available in your MCC, see a higher CTR and lower CPC & CPM, and prep for your Google AdWords Certification Test. Google Analytics – Learn how to navigate Google Analytics, analyze data and improve your overall business performance and ROI. Learn how to track web visitors and turn those visitors into qualified leads. Analytics is a powerful tool that will help you determine which practices are best for your business in terms of marketing and advertising online. Search Engine Optimization – Learn how to make your website work for you! Learn how to optimize your website & landing pages so that they show up higher in search engine results organically. Social Media Advertising – Options for advertising through social media channels have changed drastically in the last few years. Learn how to pick which platform is best for your business and how to create effective campaigns including geo-targeting, remarketing, analytics, and much more. Questions? Call 612-460-8860 to find out more about this comprehensive series. 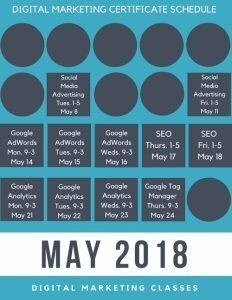 We’re excited to announce our Minneapolis Spring Digital Marketing Class Schedule for May 2018. Get the most comprehensive Digital Marketing training in the Twin Cities including Google Tag Manager (GTM), Google Analytics, PPC (Google AdWords), Social Media Advertising & Search Engine Optimization (SEO). Register today for the best Digital Marketing Classes in Minneapolis from a Google Premier Partner! Check our all our Digital Marketing Classes in Minneapolis; taught in-person by industry professionals at our school inNortheast. We’ve been teaching since 2011 and have helped many students get promotions and even land new jobs thanks to our in-depth training. Our classes are not hour-long intros. We will teach you how to properly set up, manage, optimize, report, and use your digital marketing techniques to the fullest with our 10-25 hour long class series. Google Analytics – Learn how to navigate the complex Google Analytics software, analyze data and improve your overall business performance and ROI. Learn how to track web visitors and turn those visitors into qualified leads. Analytics is a powerful tool that will help you determine which practices are best for your business in terms of marketing and advertising online. Google Tag Manager – Google Tag Manager lets you launch new tags any time with a few clicks, so you never miss a measurement or marketing opportunity. Managing multiple analytics and marketing tags for your site can be a challenge. Incorrect or repetitive tags can distort data measurement and reduce your overall site performance. This course will cover the basics of Google Tag Manager, and then we will get hands-on with creating our own Google Tag Manager installation. Search Engine Optimization – Learn how to make your website work for you without paying for online ads! Learn how to optimize your website & landing pages so that they show up higher in search engine results organically. This class is invaluable. Register today or call Rachael at 612-460-8770 with any questions. We look forward to seeing you in class! 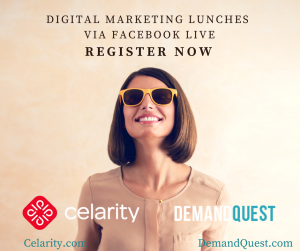 Join us as we dig deep into Google AdWords, Google Analytics, and Digital Marketing Strategies via Facebook Live. Check in from home or office as Ted Kozlowski, President of DemandQuest and International Digital Marketing Speaker tackles current best practices in AdWords and Analytics. Register for free below and we’ll send you a reminder of the event and a link to our Facebook live page. All sessions will start at 12:00 pm and will be 25 minutes long with 15 minutes for Q & A. With nearly 25 years in the business of Creating Happy Careers, Celarity is still growing. As the longest-standing staffing agency focusing where marketing and creative meet technology, Celarity understands how best to serve the local community. Digital Marketing Classes in Minneapolis; registration is now open for our career changing 2017 Fall classes. Get the most comprehensive Digital Marketing training in the Twin Cities including Google Analytics, PPC (Google AdWords), Social Media Advertising & Search Engine Optimization (SEO). Attend our 4 most popular digital marketing classes, receive your Digital Marketing Certificate, and save $350! Register today for the best Digital Marketing Classes in Minneapolis. Google AdWords – Sept 27 & 28, Oct 4, 5, & 12 from 1-5 pm: Learn how to create, manage and analyze high-performing online advertising campaigns. Learn what new features are available in your MCC, see a higher CTR and lower CPC & CPM, and prep for your Google AdWords Certification Test. Google Analytics – Oct 16, 17, 19, & 20 from 1-5 pm: Learn how to navigate Google Analytics, analyze data and improve your overall business performance and ROI. Learn how to track web visitors and turn those visitors into qualified leads. Analytics is a powerful tool that will help you determine which practices are best for your business in terms of marketing and advertising online. Search Engine Optimization – Sept 19 & 26 from 1-5: Learn how to make your website work for you! Learn how to optimize your website & landing pages so that they show up higher in search engine results organically. Social Media Advertising – Oct 11 & 18 from 1-5: Options for advertising through social media channels have changed drastically in the last few years. Learn how to pick which platform is best for your business and how to create effective campaigns including geo-targeting, remarketing, analytics, and much more. Google has been changing the face of Google Analytics gradually until it made a full overhaul. 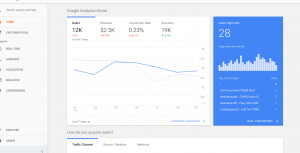 With all the Google Analytics Updates, what has changed in the new Home view? Google Analytics has become a mega reporting tool that brings out lots of information on logging in. The report picks out the key metrics that you need and brings them to the forefront. It does not require you to configure anything. The AI will do all the work for you. If you have certain goals that you need to be met through some data, Google Analytics will pull the report for you fast. Its key driver is to make it easier to pick your key insights for your client or business. Below are some of the reports that are present in the new Home View. Each report is labeled with some questions that give a basic feel of the data that you need. Google Home View: It gives you the key figures and numbers as relates to your engagement. This includes how many sessions, users, the duration of the sessions and the bounce rates. How do you acquire your users? When do the users visit your site? What are the trends of our active users over time? How do you retain your users? 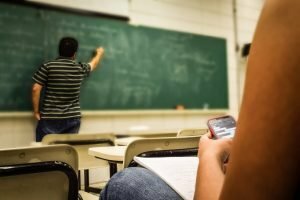 What are the top devices used to access your site? What are the pages the users visit? How is the AdWords campaign(s) performing? What is your performance against the goals? The reports are easy to read. The previews are short versions of the report. You can hover around the report for details of the specific area that you seek insight. If the detailed report is not sufficient, you can click through the main report for more details. The report is more visually appealing. It follows the design of the New Adwords design that was rolled a while back. The visual report makes it easy to pick the key insights with speed. You can also customize the reports. You can do it by changing the date range. The new data ranges include the last 30 days, the last 28 days, the last 90 days, the last quarter to the current date and the last 12 months, this year and the last year. There is so much in the new home view. It replaces the audience overview report. You can access the report but have to navigate to the audience and overview tabs in the side navigation. Google AdWords Editor12 is now available for advertisers across the globe. It comes with a new design and a number of features that include faster account downloads, custom rules and support for bidding in order to maximize conversions and many others. Google has refreshed the look and the feel of the AdWords Editor to ensure that it matches all the products that Google has in its docket. However, the new interface is purely cosmetic and does not change the user experience on Google AdWords. However, the version is easier to navigate and find your tools as you work on it. The custom rules are meant to notify you of violations in the best practices of advertising before you post changes. The notifications appear as errors and warnings. The version comes with its own built-in recommended rules but also gives you a chance to edit them to meet your needs. In addition, if you do not find these rules helpful, you can pause all of them in bulk under the custom rules view. A warning if there are fewer than four callout extensions at the account level, each ad group and search Network campaign level. The new AdWords Editor enables you to migrate data from the previous version after you have downloaded it. This makes it easier to set up and start running on the new platform. Google had initially introduced its ‘Maximize Conversions’ technology a month earlier on the web version of AdWords. The feature is now part of AdWords Editor 12. The Maximize Conversions also sets the ideal bid for every bid auction. This helps increase the number of conversions that are needed daily according to the budget you have set for the day. The new version allows you to include up to20images and 20 videos in your universal app campaigns. The version also has several new customization fields for responsive ad campaigns. The optional fields that have been added to enhance the responsive ads include the Promotion text, price prefix, 4:1 logo and the Call to action text. To learn more about Google AdWords and to get Google AdWords Certified, check out our in-depth Google AdWords Certification Series.